What's the first step in buying my first greyhound at the Ready 2 Race Sales? Gather your mates together, work out your budget and then contact someone that is experienced in the greyhound industry, ideally a greyhound trainer to assist in your purchase of your greyhound. All owners must be clear on who is responsible for re-homing once the greyhound has finished its racing career. How do I find someone I can trust with the knowledge and experience to source and assist in buying a Ready 2 Race greyhound? Greyhound trainers should have the knowledge to spot a greyhound with potential at the Ready 2 Race Sales. By contacting a trainer prior to the Ready 2 Race Heats (12 November) it will give yourself and the trainer plenty of time to analyse all lots. Do I need to attend the heats on Monday 12 November? As a potential buyer, attending the heats is not necessary however could be very beneficial. Full results and video replays of the heats will be available online at Ready2Race.grv.org.au within 24 hours of the heats being run. 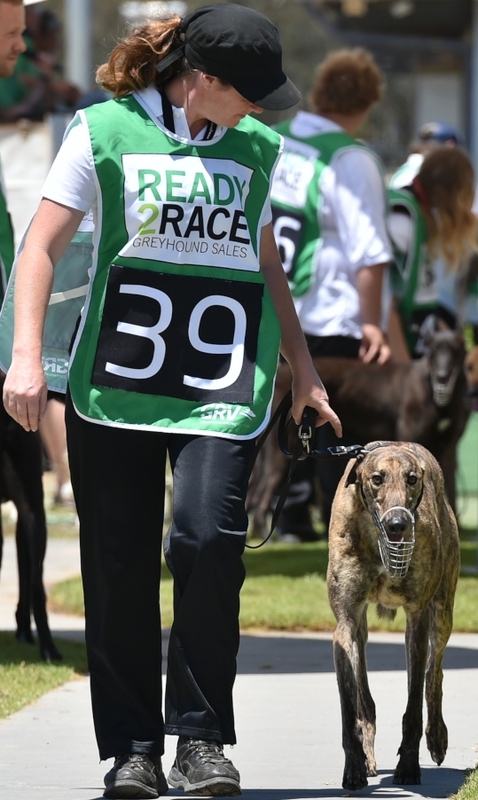 How old are the greyhounds being sold and will they have raced before? The age range of participating greyhounds is between 16 and 28 months and some have race experience which is noted in their lot information. All bidders must be registered to bid. Bidder registration can be undertaken on the day. It’s simple, and free. Registered bidders must also be registered participants of the Greyhound Racing body for the state that they reside in. Registered bidders will be given a numbered bid card and to place a bid this card must be raised and seen by the auctioneers. Do I need to attend the finals and auction on Saturday 17 November in order to buy a greyhound? All greyhounds must be purchased in person at the auction on 17 November, and greyhounds will change ownership upon completion of the transfer paperwork. If you can’t attend in person, make sure someone is authorised to purchase on your behalf. What happens to the greyhound after I purchase at auction? All greyhounds purchased in Ready 2 Race must be collected by their new owners (or the nominated trainer or authorised person) upon the completion of the Auction on Saturday 17 November. Are there any policies or procedures regarding transporting a greyhound from the Ready 2 Race Auction? Yes, to view the policy go to https://fasttrack.grv.org.au/racing/Policies. The purpose of the ‘GRV Transportation of Greyhounds Policy’ is to assist participants in providing a safe and healthy environment for their greyhounds whilst being transported by road.